Disney (and Wong) on PBS: "Walt Disney," the American Experience documentary that first aired two years ago, will be rebroadcast on the next two Tuesday evenings, part one tomorrow and part two on September 5, both at 8 p.m. EDT. Both halves are two hours long, and both are terrible misrepresentations of Walt and his accomplishments. I mention the show here only in case you haven't seen it and feel some vague urge that you should. You shouldn't; unless, that is, you have an incomprehensible urge to spend far too much time with the likes of Neal Gabler and Richard Schickel. Another PBS documentary with a Disney connection will be broadcast on Friday, September 8, three days after the second part of "Walt Disney." Tyrus," about the very long life of the Chinese American artist Tyrus Wong, will be broadcast at 9 p.m. EDT as part of the American Masters series. Note the distinction: American Experience for Walt, American Masters for Ty Wong. The distinction is significant: Walt was presented in his PBS incarnation as essentially a sociological phenomenon, whereas Wong, it's clear from the preview material, will be presented as an artist whose work is not just worthy of respect on its own but also stands as a monument to one man's triumph over racism. This is, as I suggested early this year shortly after Wong's death at the age of 106, mostly malarkey, but I must admire the selling job that won Ty a PBS documentary and a remarkable front-page obituary in the New York Times. Ty's work was excellent, to be sure, but his timing was also superb. Beyond Ink and Paint: That's the title of a documentary film that Christine Guest is making about women in animation. She has filmed interviews with an impressive roster of women and a few men (so Don Hahn is on the interview list—but where is Jenny Lerew?). She is attempting to raise the money to complete the film through a Kickstarter campaign. I am allergic to Kickstarter campaigns in general—I can't help but think of John Kricfalusi's campaign for a cartoon to be called Cans Without Labels, a campaign that attracted lots of money but several years after its conclusion has resulted only in a decidedly unfinished (and, so far, godawful) film. Beyond Ink and Paint is, however, the rare instance of a Kickstarter project that is worthy of your support. And time is running out—the deadline is August 30. You can read about this project and make a contribution by going to this link. From Christian Svenningsen: I've only seen part 1 of the PBS documentary of Walt Disney on DVD, and again on television with Danish subtitles not so long ago. But somehow I don't like it, maybe because of the misrepresentations of Walt Disney. The only documentaries I like is the Man Behind the Myth, the Walt Disney Story and all the others from the past. "Jake": I mentioned last month, when I was writing about "Jake," my decidedly former literary agent, that he and I shared only one Facebook friend, the excellent caricaturist Drew Friedman. As I suspected, and is so often the case with Facebook "friends," the connection between Jake (his real name, actually) and Drew was essentially nonexistent, and Drew unfriended Jake when he read my account of my unfortunate dealings with him. This is what I dislike most about Facebook, and why I am so relucant to "friend" people I don't know, however legitimate they seem. It's all too easy to find yourself a "friend" of someone as low-grade as Jake. Like Drew Friedman, you can "unfriend" that person when you learn what he or she is really like, but in the meantime, damage has been done. "As I told Matti Eronen, I have always been very fond of his printed book from 1994, but I really missed seeing the surviving comic book art. The main purpose of the new website is to show good photos/scans of the original pages. 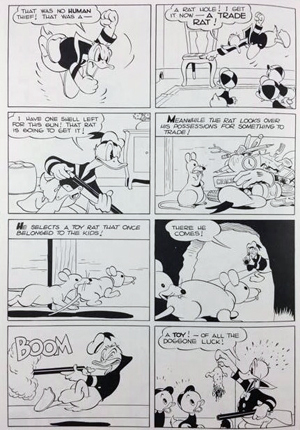 For the most part I have used scans from the Carl Barks Library [the multi-volume set published years ago by Another Rainbow] in black and white. but I have started to change these scans to reproductions from the originals—when I am able to find them (a very difficult task). So far, of the 200 pages shown on the site, about 80 are reproductions from the original artwork.. For now, reproductions of the remaining surviving pages on the site are from the CBL—though I have some difficulties with the story from Uncle Scrooge No. 13, 'Land Beneath the Ground.' I am not really sure which parts have survived." There are surprises (at least I was surprised) to be found on Søren's website, like the multiple Barks covers from the early fifties, many of which Barks himself colored and signed. You can visit Søren's admirable website, and possibly help him fill the gaps in his reproductions from the original art, by clicking on this link. From Donald Benson: Gag panel shows comic book editor haggling with artist: "Fifty a page? Like it's gonna end up in a private collection in Finland?"